Like the drum machine, polyphonic synthesizers, crazy hair and shoulder pads, the chorus effect is a huge part of what made 80s music even possible. Today, the complex, multi-layered shimmer it gives the electric or acoustic guitar has become a must-have part of any guitarist's sonic arsenal. With the T-Rex Chorus + flanger, you get a beautiful, richly textured chorus sound that will add a whole new dimension to your playing -- all via two perfectly simple controls: RATE and DEPTH. Along with the chorus effect, the T-Rex Chorus + flanger also includes a great sounding flanger mode. Closely related to the phase shifter, a flanger gives your sound a weird extra twist that your audiences won't forget. Chorus + flanger is part of the T-Rex Tonebug series, a growing line of pedals that combines the classic T-Rex tone found in our high-end pedals with intuitive, uncomplicated controls -- all at a price that any guitarist can afford. 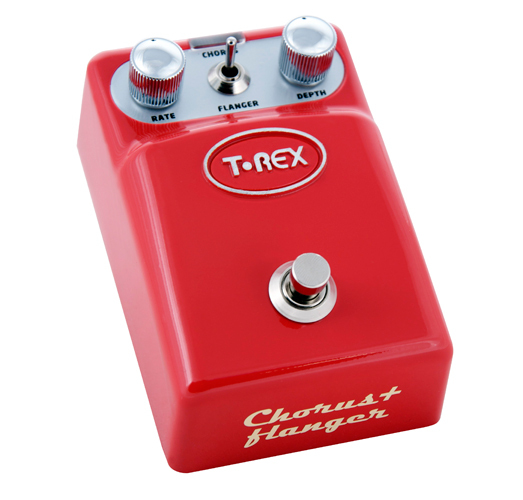 Take the T-Rex Chorus + flanger for a spin yourself - you won't want to leave the music store without one!